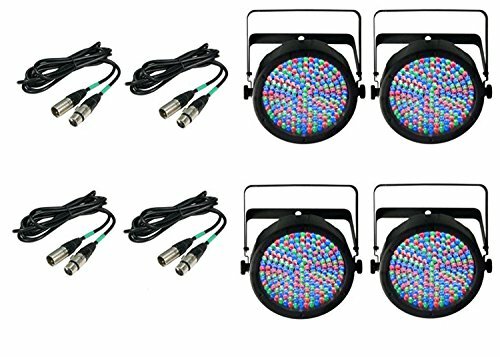 The Chauvet SlimPAR 64 RGBA LED PAR Wash Light with DMX Control is designed for live entertainment applications such as DJing, concerts, night clubs, and other venues. The unit features 180 Red, Green, Blue, and Amber 10mm LEDS that produce a powerful spread light source with a beam angle of 14° and a field angle of 23°. You can control the unit over channels 4 and 8 using DMX cables and with master/slave mode for color mixing and programming a lighting display. Alternatively you can select one of the unit's built-in automatic lighting programs or set the light to be triggered by sound using its built-in microphone. Multiple units can be daisy chained together to save on power cabling or you can use the light with Chauvet's Satellite battery operated system. The unit's lightweight construction and slim form factor allows you to hang it from an overhead truss and the numerous control options enable you to program a lighting display that complements your performance.